This is the state of our pizza delivered earlier by Domino's. Needless to say it was in pretty sad condition piled in the box! This is getting some comments on the Facebook pages of Domino's, Papa John's, and Pizza Hut. I have even received feedback on Twitter! I sure didn't appreciate the manager of the local store being rude on the phone with Melisa. Now to be fair, the District Manager called to make arrangements to personally deliver the refunded cost of our ruined pizzas to our home and offer an additional credit for a future purchase. Melisa has already made it known that the credit will not be used unless a competitor honors it. We go with Pizza Hut here. 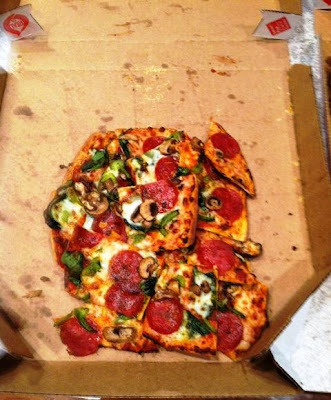 They open the box when they deliver, so you both know the pizza's condition.